Collages are an ink blot test for me of sorts - I like to sit down with a pile of magazines (Smithsonian's a big favorite but fashion ones'll do fine), a pair of scissors, copier paper, rubber cement. I don't think about what I'm putting together, just start separating things as they strike me, then group them by color, texture. An hour or so later I look down at the page and some message bubbles up. Every bird needs a home. 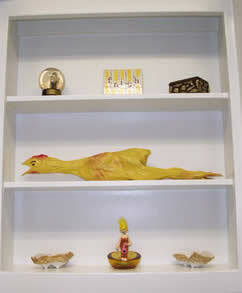 When I moved into this apartment and saw the shelves above the kitchen sink I knew I'd found Free Range's. So many of my favorite things in one place it makes my head swim - my oyster shaped bowls, bouffant-haired day of the dead lounge singer, St. Theresa snow globe, box with milagros, and tile I painted a few years back. Items are primarily red or yellow, with some pink and green also mixed on. 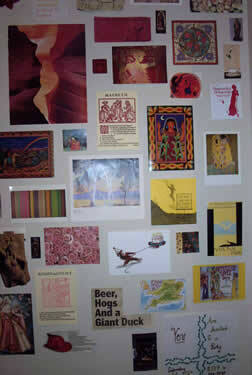 Postcards, magazine pages, newspaper headlines (the "Beer, Hogs and a Giant Duck", for instance), whatever struck me. Favorite items include a flier from SS the SS's and my first party at our first apartment on Capitol Hill (in the lower right - "You | Are Invited to a Party | Saturday July 27 8:30 pm (our address) | RSVP to (our phone) for the secret password"), "Mystery Date" postcard, Image of Monet's "Juan-les-Pins". Items are primarily blue with some pink and purple mixed in. Includes magazine pages, cards, photocopies, some of which I've been carrying around with me for years. Favorite items include the only known copy of the crest for Hubba Gamma (the pseudo sorority founded by HK, Tess and I back in college) on the upper right, the seating card from when I was ML's confirmation sponsor (pink, on the lower left), and the image of turquoise stones (center).